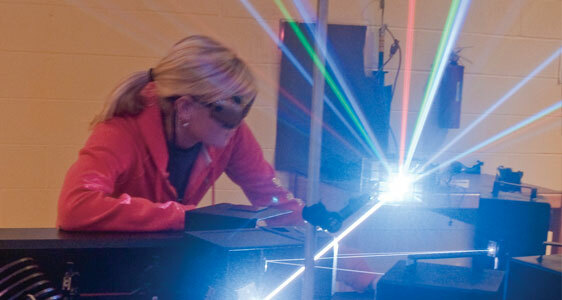 Laser and photonics technology is a high tech program focusing its instruction on understanding the application of electronic, fiber optic, photonic, and laser principles. An emphasis on hands-on learning prepares students for real-world projects and practical applications. According to department faculty, this focus on application of knowledge rather than theory leads to a better understanding of the work environment and the utilization of new technologies in a variety of industrial, medical and business settings. While four-year university instruction focuses a majority of time on theory, the LPT program at CCCC instructs students on theory, but uses the majority of its instruction time in a variety of lab environments where theory is put into action. Successful students tend to enjoy problem solving. They like working with their hands, learning how things work, and have an interest in math and science. Lasers and photonic technologies are utilized in a variety of fields. Graduates find jobs in fields that vary from medicine to manufacturing. While jobs are available locally, graduates with a willingness to relocate will find many opportunities for advancement. CCCC LPT graduates are working across America. Most graduates earn starting salaries in the range of $30,000 annually. Some, depending upon previous experience and credentials, are earning as much as $60,000 a year. Graduates are employed as laser technicians, manufacturing test technicians, fiber optic, field service, and electronics technicians. Many jobs are now available in the medical field where graduates utilize their skills in biophotonic medical applications. Biophotonics is an emerging field where lasers and light are used in medical procedures and treatments. LPT graduates are employed to install, maintain, and repair biophotonic medical equipment. The program, offered at the Harnett Main Campus in Lillington, NC, is designed to be completed in two years. Instructional facilities include two state-of-the-art electronics labs along with four high-powered laser labs, plus high tech, Internet-ready classrooms. Analyze, configure, test, measure, troubleshoot, and assist in the design of analog, digital, and microcontroller circuits and systems. Identify different types of light sources of spontaneous and stimulated emission and describe their different properties. Describe requirements for laser safety, specifically major dangers, the different laser class levels, protection requirements of the different class levels, and be able to calculate, and specify, safety parameters for laser systems, such as nominal hazard zone (NHZ), maximum permissible exposure (MPE) and minimum optical density (OD) required for a specific laser power and recommended MPE. Construct, analyze, test, measure, troubleshoot, and assist in the design of optical systems. Describe or explain the concept, structure, and operation of gas lasers, semiconductor lasers, and solid state lasers, and be able to safely operate, test, measure, and align, where appropriate, these lasers using optical test equipment and procedures. Properly clean and install optical components using proper optical component handling, cleaning, and installation methods. Recognize the need to maintain currency in modern photonics and electronics applications, new products, and systems.